From March 29, 2019 to April 25, 2019, save $500 on all 30" Ranges, $750 on all 36" Ranges and $1,000 on all 48" Ranges purchased from Miele under Miele Pricing, Miele Advantage or Miele Advantage Plus. HR 1124 G, HR 1421, HR 1622, and HR 1924 G are considered 30" Miele Ranges. HR 1134 G, HR 1136 G, HR 1135 G, HR 1934 G, HR 1936 G, and HR 1935 G are considered 36" Miele Ranges. HR 1954 G, HR 1956 G, and HR 1955 G are considered 48" Miele Ranges. 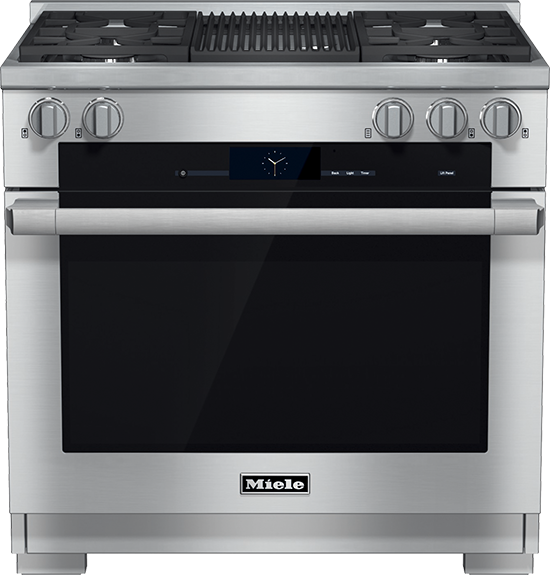 This Range promotion cannot be combined with the Miele Complete Cooking Program. Excludes Range Tops. Multi-residential, builder purchases, b-stock, accessories, employee purchases and obsolete appliances are excluded. Delivery and Installation are not included. Miele Certified Installation Program includes a one year warranty on parts and labour and is only applicable if Miele product installation is carried out and completed by Miele Certified Installer. A 20% restocking fee applies to all product returns. An administrative fee of 10% applies, if order is cancelled or terminated prior to delivery for any reason and is based on the deposit for product(s). Delivery must be completed by December 20, 2019. Accepted methods of payment for down payment of 25% at point of sale are American Express, Visa or MasterCard credit cards. Outstanding balance(s) are to be settled prior to delivery. Methods of payment for outstanding balance(s) are American Express, Visa, MasterCard or electronic bill payment for orders where total order value before applicable taxes is less than $15,000. For orders where total order value before applicable taxes equals or exceeds $15,000 before applicable taxes, the method of payment for outstanding balance(s) is electronic bill payment only. Offer excludes B-Stock, display and obsolete models. No refunds and substitutions of either products or promotional offers. Applicable taxes are extra. Offer is not available to dealers, builders or contractors. Offer is available on retail purchases ONLY. Offer has no cash value. No refunds and substitutions. Offer is open to Canadian residents only. All products purchased under this promotion must be shipped to a Canadian address. This offer cannot be combined with any other offer. Miele reserves the right to change or terminate this promotion at any time without notice. "Miele" and the Miele logo are registered trademarks of Miele & Cie. KG. © 2019 Miele Limited.